The artificial reefing project known as “RGV Reef,” already responsible for a big boost to the red snapper population off South Padre Island, was pulled through a rough patch recently by a generous band of benefactors. So says Gary Glick, president of Friends of RGV Reef, the volunteer group behind the project, at 1,650 acres the largest artificial reef on the Texas coast and the only industrial-sized reef in the Gulf of Mexico. The pile is meant to interrupt the current, thus churning up nutrients into the photic zone, where they’re eaten by plankton, which are eaten by sardines, which in turn are eaten by snapper and other game fish. Glick has called it a “focal point for all of those fish that we love to catch,” noting that marine scientists are also closely involved with the project. “Railroad ties make the best habitat around, because they stack with all kinds of cracks and crevices,” he said. 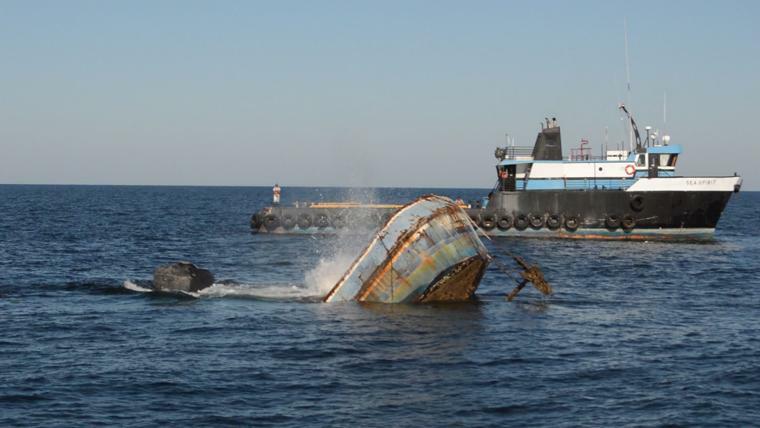 The first load of reef material was sunk in summer 2017. Within 30 days an estimated 240,000 juvenile snapper were on the scene, the vast majority of which would have otherwise been eaten, since the seafloor offers no natural protection at that depth, Glick said. Now those fish are reaching catchable size, and people are catching them, he said. Glick said “Friends,” with assistance from a Coastal Conservation Association grant, bought another 360 pallets of cinder blocks that will be sunk, along with 1,600 tons of broken concrete, to create another 200 acres of fish nursery in the northeast corner of RGV Reef. The material will be used to form about 150 small “patch reefs,” which will provide shelter, habitat and food for another 100,000 to 200,000 juvenile snapper, he said. “I would like to raise 300,000 or 400,000 snapper every year,” Glick said. The 45-foot-tall pile of railroad ties, meanwhile, s its in 75 feet of water and has already attracted a greater variety of species — including lobster — than anywhere else on the reef, he said . 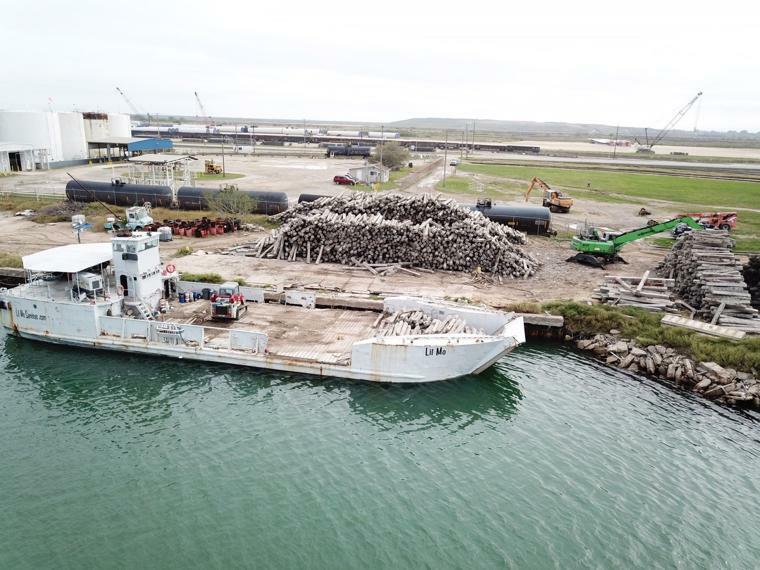 EMR/International Shipbreaking and the Port of Brownsville are providing space on the Brownsville Ship Channel to store the ties and other reefing material and load it from rail cars onto Lil Mo, a Vietnam-era landing craft the group has hired to transport the material to the reef site. Handling the 8-foot-long, 700-pound ties, donated by BNSF Railway, is an awkward process requiring an expensive material handler with a long reach, since the bulkhead at the staging area is relatively weak and might collapse under the weight of a heavy machine too close to the edge, Glick said. The organization used a loaned “ancient machine” to move 5,300 tons of ties over summer, he said, though come fall the owner said he needed it back unless friends would buy it, which the group did for $38,000. But t hen Lil Mo broke a propeller shaft and was stuck in Port Aransas for several weeks for repairs. Upon the vessel’s return, the material handler was fired up and r an for two days before the engine gave out. He described the situation as a “train wreck.” The railroad ties, meanwhile, kept arriving by the car load. To the rescue comes Max Nichols, a longtime supporter of the reef project, who paid for a replacement material handler and even provided a mechanic to inspect it, Glick said. Now EMR and Foremost Paving have stepped up to dig ditches and otherwise impro ve drainage at the site, while Foremost has offered to build subgrade for a road, for which BSFN has pledged six carloads of rock, Glick said. Glick also credited Daniel Bryant, owner of Bryant Industrial Services for saving the project time and again. It still takes money, of course, for Lil Mo and other essentials . Glick said he wants to keep the project rolling long enough to finish it, though he’s not sure how much more money is out there to raise. “I need somebody to tend to fundraising,” he said.